Kentucky Hot Brown Mac and Cheese - THE BEST!!! We ate this two weeks in a row. Seriously DELICIOUS! 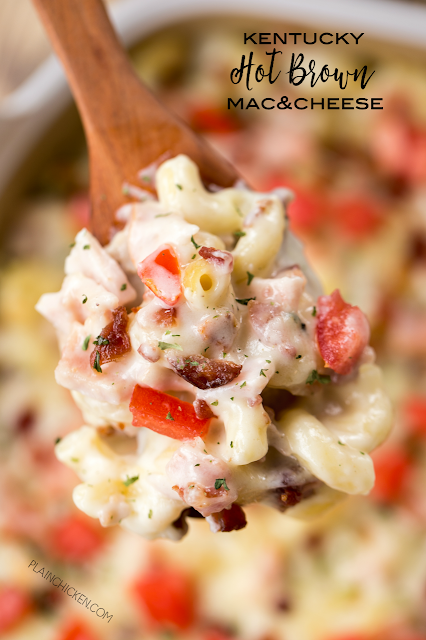 Macaroni, flour, butter, onion, salt, pepper, milk, gruyere cheese, turkey, bacon, tomatoes. All the flavors of a Kentucky Hot Brown Sandwich in pasta. Everyone cleaned their plate and went back for seconds. This is a new favorite. GREAT macaroni and cheese recipe! The Kentucky Derby is coming up. Now, I'm not a horse racing fan, but we always seem to watch the derby. I find the Derby more of an excuse to eat and drink with friends! There is nothing better than sipping a Mint Julep and eating some Kentucky Hot Browns. 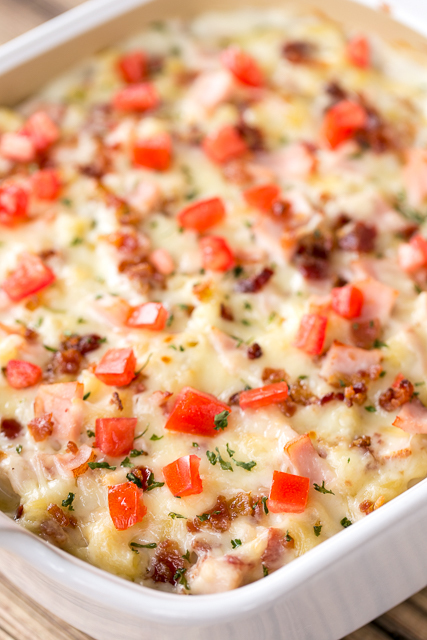 I have several variations of the original on the blog, but this Kentucky Hot Brown Mac & Cheese might be my favorite. Pasta loaded with turkey and bacon and tossed in a Gruyere cheese sauce. O-M-G! SO decadent! For this recipe I used some really thick sliced turkey deli meat. I wanted to have nice bites of turkey throughout the mac and cheese. I used Gruyere cheese in the cheese sauce. Gruyere can be expensive, so feel free to substitute Swiss cheese if you don't want to splurge on the Gruyere. I think it is totally worth the splurge! We topped this Kentucky Hot Brown Mac & Cheese with some fresh diced tomatoes. This has all the flavors of a hot brown but tossed with pasta. We loved this dish! I cannot wait to make it again for the Derby! Preheat oven to 350ºF. Lightly spray a 9x9-inch pan with cooking spray. Set aside. Melt butter in a large sauce pot over medium heat. Add flour and cook 1 – 2 minutes, but do not brown. Slowly whisk in milk, onion powder, salt, and pepper. Bring pot to a simmer. Cook until sauce is thick, about 5 – 6 minutes. Remove from heat and stir in 1-1/2 cups shredded cheese into sauce until melted. Add cooked pasta. Stir in chopped turkey and cooked bacon. Pour pasta mixture into a 9-inch square baking dish. Top with remaining 1/2 cup of shredded cheese. Bake for 20 minutes. Remove from oven and top with chopped tomatoes before serving. Super idea Steph and looks delicious. We just had Hot Browns a couple of weeks ago and I see this as a must try. Hope you enjoy it, Larry! Our favorite side dish in our house is Mac and Cheese. Have to try making this great recipe. It definitely looks great in that picture!!! We enjoy hot browns a lot when we have leftover turkey. I tried this recipe today using chicken and sharp cheddar cheese. It came out really well. Delicious idea. Thanks. Can you double it and bake in a 13 x 9 for more people or just make two ??? Sure! You can double it in a 9x13 pan. Enjoy!